Welcome to Turbulence Training Day 25. Home fitness workouts that'll burn fat and sculpt your body in 4 weeks. 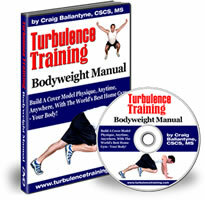 This is day 25 of Turbulence Training's Buff Dudes and Hot Chicks fat burning workout. "Hello and welcome, I'm Asad from Better4Fitness.com and today's Day 25 of the Buff Dudes and Hot Chicks workout. It's another rest day today and I'm back in Wimbledon Park, with the tennis courts behind me. I'm getting my recovery day light exercise done here. The reason why this park's really good (and why I keep coming back here) is because it's got loads of stairs and hills and... kids and ducks attacking you from time to time, but that's all part of the fun(!). My knee's feeling much better today, which I'm really thankful for. Any kind of knee pain with me, I get quite apprehensive. It was a worry for a day but the pain went away yesterday, and today it's absolutely fine. I've been walking around going up and down stairs so it's fine. Looks like it might rain here so I'm gonna wrap this up. If you haven't checked out what I'm doing then get to Better4Fitness.com and get involved yourself, give it a go - these are really good workouts, intense but you can see results from 4 to 8 weeks - you'll start seeing results and get really motivated to continue and that's what it's all about. So take care and I'll see you tomorrow."